Courtisane Festival 2009. Gent, 23 – 26 April 2009. Former US Defense Secretary Donald Rumsfeld, February 12, 2002. Let Me Count the Ways is a series of meditations on violence and fear, and their reverberations on cultural history. The episodes have been built out of a mixture of personal reflections and diverse image material which present the phenomenology of fear with an intensity that breaks abruptly the border between past and present. Just as in earlier work, Thornton explores the social effects of new technologies and media, but here she goes deeper into autobiographical territory, suggesting we are all involved in these developments. In her work, Soon-Mi Yoo investigates the peripheral histories of Korea, as a personal exploration of alienation, loss and the atrocities of war. 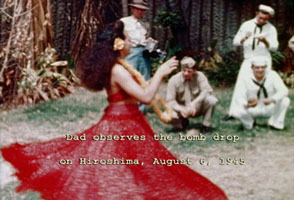 This video is a compilation of landscape images, filmed by the American troops during the Korea war. These damaged places are flawed and incomplete, many are being lost just as they are seen. She asks herself : “is it possible to see the landscape of the past even though it was first seen by the other’s murderous gaze?”. By juxtaposing these images, Yoo creates a space where connections can be made between personal experience and public memory, historical perspective and private suffering. “A search for a non-existent image, a desire to create an image where there is none,” culminates in a critical reflection on the relationship between documented history and non-registered memories. 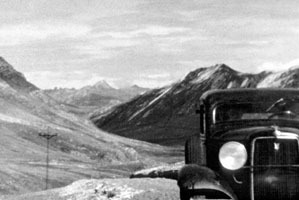 Through interviews and diverse archive material, Tajiri goes in search of her family’s story during WWII, as thousands of Japanese Americans were taken to internment camps. She explores the influence of images in the construction of memory and identity, asking herself why certain images grow into historical symbols, whereas others are obstinately suppressed. “The past is never dead. It’s not even the past”. This quote by American writer William Faulkner could situate quite accurately the work of Matthew Buckingham. In his installations, he assembles and reinterprets historical documents and representations as a way to question the relationship between past and present. Situation Leading to a Story is based on four amateur films from the 1920’s that Buckingham found on the streets of New York. The search for the origin and context of these private images leads to a criticism on the ways in which images of the past are used as a fantasy of history. 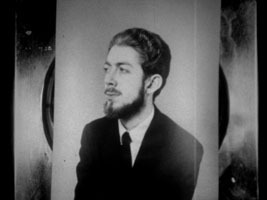 Hoffman’s first film already presents all the characteristics of his later diary filmmaking: a fascination for family history and the reconstruction of memory, but also a complex temporal structure that dismantles the conventions of documentary filmmaking. A series of photo portraits is the basis for an intimate investigation on the way identity relies on the familiar system of role play, projection and fantasy. Hoffman breaks the thin ice between document and fiction, fact and imagination, past and present, revealing the fissures and rip tides that hide beneath the misleading calm surface. 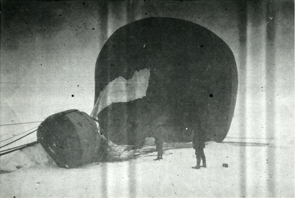 In the guise of a historiographical study on an failed expedition to the Arctic in 1897, Baron investigates the limitations of images and other forms of documentation as a historical reference, and the paradoxical relationship between the temporality of the moving image and the stillness of photography, between historical time and “real time”. Or how the image, regarded as a necessary condition for both memory and history, says everything and nothing at the same time . 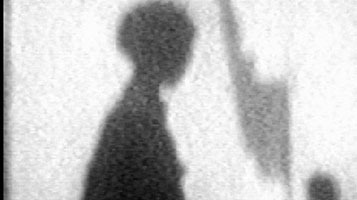 In the 1980’s James Benning – a key figure of American avant-garde cinema – made a series of films in which his rigorously structured explorations of time and space were injected with a fascination for aspects of American memory. 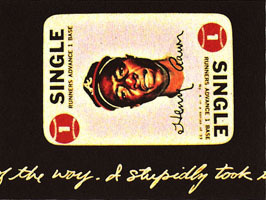 American Dreams is constructed as a simultaneous, chronological presentation of the filmmaker’s collection of Hank Aaron memorabilia (who was an idol of the young Benning, a good pitcher himself), written excerpts from the diary of Arthur Bremer (Benning’s neighbour in Milwaukee, who would attempt to assassinate Alabama governor and presidential candidate George Wallace in 1972) and a compilation of radio fragments. The result is muti-layered constellation of image, text and sound, which develops into a personal meditation on growing old, race, masculinity, popular culture and political transformations during one of the most turbulent periods of recent American history. 1937 : the year that Nora Dagabian’s father was arrested in Yerevan the capital of Armenia, during the Stalinist ethnic cleansing operations by the Soviet Army. Martirosyan combines interviews with Nora, now 70 years old, with archive images and re-enactments. The different temporalities overlap; stories and words become mixed up; images pass from one to the other; voices are superimposed, dubbed, transferred from one body to the other. A reflection on the process of remembering and the relationship between individual and collective memory. This video essay suggests a post-nuclear future in which humankind has been confined to outer space. The narrator is a fictional descendant of Anjalika Sagar, one of The Otolith Group members. She looks back at several generations of women from her family, linking her own experiences with those of Sagar’s grandmother, an Indian feminist in the 1960’s. Her attempt to understand the multiple dimensions of the historical and the evolutionary generates a number of images, which include the fragmented histories and utopian aspirations of the 20th century. Otolith presents a “past-potential-future”, making possible an alternative perspective on the present. 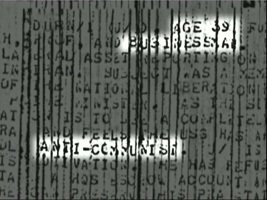 BAFC was a British collective of filmmakers active in the 1980’s and 1990’s who expressed their radical views on the post-colonial decline of the imperialistic world order, the disastrous socio-economic effects of Thatcher’s doctrine and the meaning of the diasporic condition in an evenly radical way. Handsworth Songs explores the origins of the riots in the Birmingham district of Handsworth, where the local black community rose against a political policy that they considered as a return to colonialism. In contrast with the didactic panoptic impulse of the documentary film tradition, filmmaker John Akomfrah chose an open, polytonic structure where eye-witness accounts, mediated voice-overs and a mosaic of sound, intersperse with a poetic montage of archive footage. The inherent historical discourses are dismantled, and in result the impressions of the past gain a new place in the constellation of the present, as a promise to the future. “There are no stories in the riots, only the ghosts of other stories”. In his films, sculptures, photographies, artist books and paintings, Kevin Jerome Everson responds to daily materials, conditions, tasks and gestures of people of African descent in North America, illuminating, as he puts it, the “the relentlessness of everyday life”. In According to…, stories of interracial murders in southern rural America are told twice, offering different versions of the tragic events. 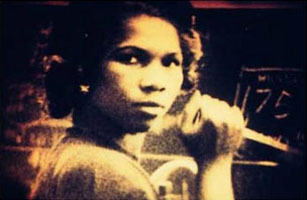 Everson combines found footage and newly shot material to reflect on the experience of African-Americans before the rise of the Civil Rights movement. 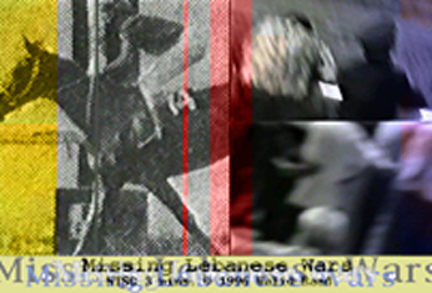 A videotape in three parts exploring the possibilities and limits of writing a history of the Lebanese civil wars (1975-1991). 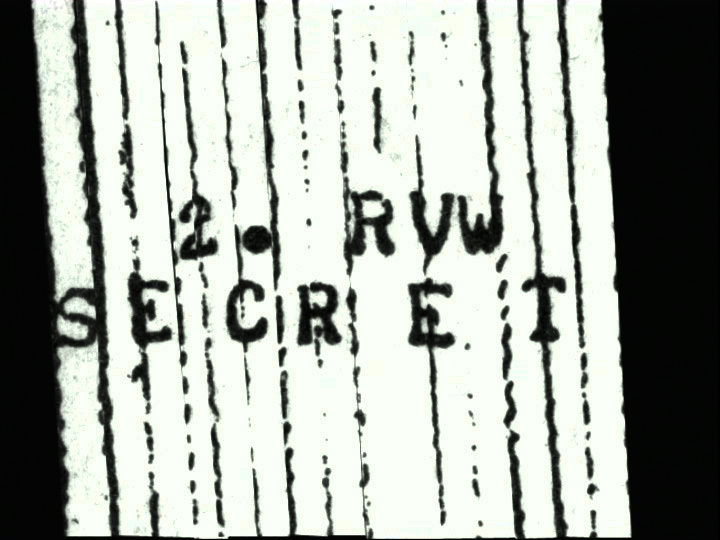 Constructed out of innocent and everyday material, the tapes do not intend to document what really happened, but instead choose to explore what could be imagined. In his works, Walid Ra’ad analyses mass media images and narratives on war, and more precisely the Lebanese civil wars, in order to re-write a history in which notions like ‘experience’, ‘time’, ‘evidence’, ‘testimony’ all intermingle. The document – its production, collection, circulation, reception and sociological effects – is at the centre of the work of Julia Metzer and David Thorne (aka The Speculative Archive). In It’s not my memory of it, three recollected documents – the account of a former CIA source in Iran in 1979, the burial at sea of six Soviet sailors conducted in a U.S. Navy ship during the Cold War, and a publicly acknowledged but top-secret U.S. missile strike in Yemen in 2002 – provoke a reflection on the dynamic of a knowing and not knowing, addressing the question of the expansion and intensification of secrecy practices in the current climate of heightened security. In 1965, Indonesia president Sukarno was overthrown by military general Suharto. The CIA provided equipment. The MI6 provided black propaganda. The US military provided training. The US State Department provided death lists. Between 500,000 and 2 million people were massacred in less than six months.10,500 people died at Sumatra’s Snake River. In sponsored by suppressed policy sportsmanship – something about the war, footage of William Colby giving a speech on the progress of the Phoenix Program is taken from the National Archive in Washington, D.C. The Phoenix Program was a civilian extermination programme modelled, in part, after the ‘successful’ massacre of communists in 1965 Indonesia. The sound remains classified, and so Vision Machine employs a lip reader (who is deaf) to read Colby’s lips. It is not easy, because the footage is blurry, and the lip reader requires eight passes to produce even a fragmented sense of what Colby is saying. With each pass, the lip reader picks out more and more phrases – ‘from time to time’, ‘different religions’, ‘sportsmanship’ and ‘64 days ago’. The words from each pass are layered over the others, each at the same moment of utterance. 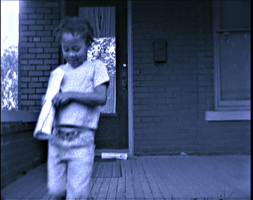 This results in a thick and strangely contoured voice track – some moments become dense with the same words or phrases, a crowd of echoes seeming to issue from Colby’s mouth; at other moments different words are read from the same mouthing, the syllables of each interfering with those of the others to produce a perverse double (or triple) speak; some words are picked up on one pass and not another; different words are picked up on different passes. As he mimes, he is mimicked – both mocked and mined for what he withholds. Some historical knowledge is yielded, something more is made known of the regional policy that he was instrumental in shaping and administering. But in place of an account of the murders, in place of the murderous directives, and in place of the voices of the murdered, we have footage of a small, bespectacled man in a suit, mouthing banalities in silence. This silence is telling, it speaks at once of the uncertainty of historical knowledge, and of the deliberate attempt to erase it. In DATE: no date, two former death squad members re-visit the execution site on the banks of the Snake River. Each takes it in turn to play victim and executioner. Though they met for the first time only hours before the re-enactment, they keep up a perpetual banter, inspired at moments, and there’s a macabre hilarity to their madcap double act at others. One searches in vain for signs of authentic and difficult remembrance among the profusion of graphic detail. 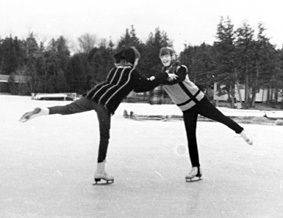 Instead, one finds a chilling pantomime, a performance that follows a seemingly shared script. This local scene is a perverse rehearsal of the massacre’s official history – a terrifying show of force. In William Egan Colby (64 days ago), Samsuri, a local woodcutter, Ludruk opera performer and survivor of the massacres, is possessed by the spirit of William Colby during an improvised midnight performance. Here, the piece is also possessed by the sudden spectral intervention, because to accommodate this remarkable and unexpected cameo, the camera keeps filming, recording in real time Samsuri’s crisis, which halts the Ludruk performance, causing its scenery to be deconstructed around him as he lets out sibylline whispers and growls, as the rain falls and falls, as the audience disperses, as the spirit departs and Samsuri looks around bewildered at the now bare stage he is sitting on – the whole process in a single ten-minute take. * inspired by Thomas Elsaesser, ‘History, Media, and memory – Three Discourses in Dispute?’, in Ulrik Ekman & Frederik Tygstrup (eds. 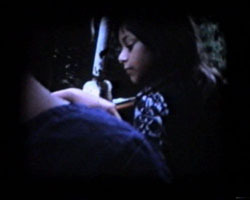 ), Witness : Memory, Representation, and the Media in Question, Museum Tusculanum, 2008.